MIAMI: Gerard Pique delivered Barcelona’s match winner over Real Madrid on Saturday as El Clasico Miami lived up to the hype. The Spanish international steered in a Neymar free-kick in the 50th minute to seal a 3-2 win for the Catalan giants in front of 66,014 at the Hard Rock Stadium. Lionel Messi, who put in a superb 64-minute performance, opened the scoring after just three minutes and when Ivan Rakitic doubled the lead soon after, the writing appeared to be on the wall for a sluggish Real Madrid side. Yet Zinedine Zidane’s side quickly woke from their slumber and by the end of the first half, goals from Mateo Kovacic and Marco Asensio had pulled them level. What followed was entertaining, often breathless friendly fare before Pique struck that decisive goal. This was nothing more than a pre-season match and obviously wasn’t going to affect the overall record between these two old rivals, which stands at 93 wins for Real, 91 for Barcelona. Their last meeting was quite incredible. Messi’s last gasp winner, his 500th for the club – it was quite a night. Madrid had the last laugh in May, winning La Liga and the Champions League, but actually arrived in Miami off the back of two exhibition defeats – a penalty shoot-out defeat to Manchester United before City also did a number on them in Los Angeles, running out 4-2 winners. 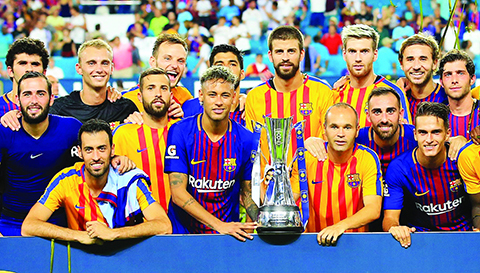 Barca, meanwhile, had beaten United and Juventus in International Champions Cup friendly competition, but the ongoing uncertainty surrounding Neymar and the interest from Paris Saint-Germain has cast a serious cloud over their two-week stay in North America. The Brazilian started for Ernesto Valverde’s side and while the rest of his team-mates head home he will fly to China to perform commercial obligations on behalf of the club. To their credit, and much to the obvious delight of the organisers, both teams didn’t hold back with their starting lineups. Messi and Luis Suarez started in attack while Bale, Modric and Karim Benzema were all unleashed by Madrid manager Zinedine Zidane. Neymar’s first involvement was to fall to the ground and clutch his ankle. For a moment it looked like his evening would be over before it began, though he was back on the pitch in time to see Messi open the scoring with just three minutes on the clock. The Argentine ace waltzed into the box and lifted a shot past Keylor Navas via a deflection off Raphael Varane. And it wasn’t long before the Costa Rican international was picking the ball out of the back of the net once again. On six minutes, Neymar, gradually moving more freely, squared the ball and it found Rakitic, whose finish was clinically struck in the seventh minute. What a start for Barcelona. Real had barely escaped their own half and were lucky not to fall further behind on 13 minutes when Suarez fired over from close range. Yet with Madrid’s first effort on goal, Zidane’s side pulled one back. Croatian Kovacic evaded a challenge just outside the box before arrowing the ball past the outstretched hand of Jasper Cillessen. Suddenly, the game was on. Benzema, who’d barely had a sniff, dragged just wide on 19 minutes with Cillessen beaten. Navas remained the busier keeper, however, and was on hand to repel Messi once again on 31 minutes. It was a key save because on 36 minutes, Asensio levelled for Madrid. Los Blancos were counter-attacking dangerously and it was left to Modric who squared for the Spaniard who took full advantage of Jordi Alba missing the ball to rifle past a horribly exposed Cillessen. Both teams retained their star men after the restart and it was Neymar whose pinpoint free-kick was steered home by Pique in the 50th. While the clash of the Spanish rivals was supposedly a friendly, Rakitic was lucky to escape a red card just after the hour mark when he appeared to push referee Jair Marrufo.